Thinkin’ Big is an 18-piece big band from Boston, MA, formed in October 2010 and began as an outlet for student composers and musicians to get additional performance opportunities. It has stayed true to its roots, and now showcases the vast compositional talents of band leader and trumpeter, Jonah Francese. What makes this group special is that it is a tight-knit musical family from Berklee College of Music and New England Conservatory, representing some of the finest young musicians from all around the world. With styles ranging from funk to swing, to Latin, Thinkin’ Big’s unique sound pushes the limit on traditional expectations of a big band, defying categorization to create a modern-day large ensemble that melds together 18 individual voices to form one united harmony. 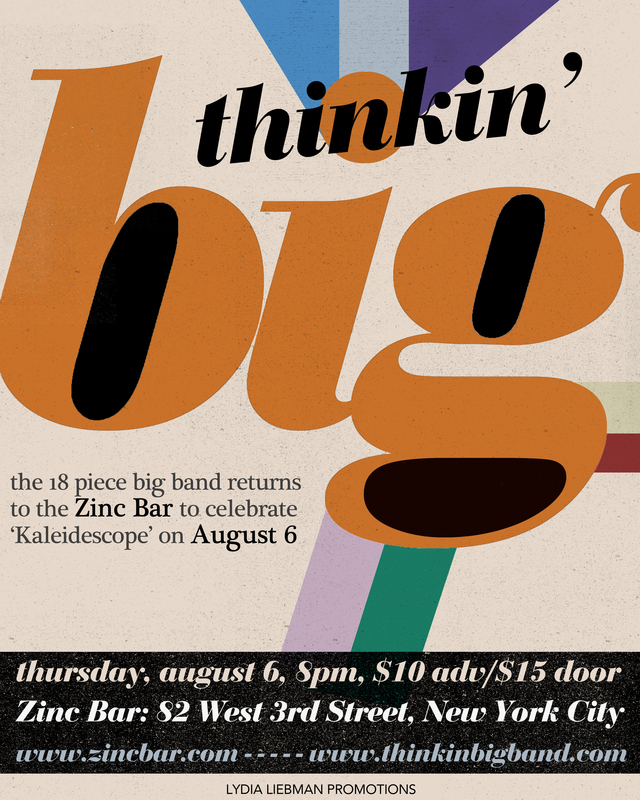 Thinkin’ Big is thrilled to present material from their most recent release, Kaleidoscope, at the Zinc Bar on August 6! ← Mario Castro on WBGO’s The Checkout TONIGHT!